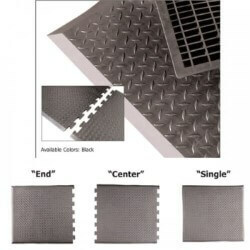 Learn the benefits of anti-fatigue style mats and runners. 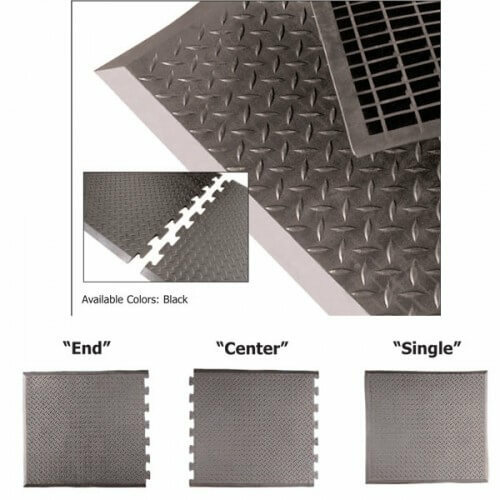 The 1/2" thick Diamond Top Interlock™ features a rubber diamond plate top surface for traction, and a sturdy waffle support system on the underside for maximum comfort. 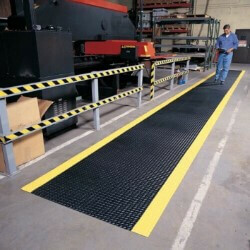 Offered as a stand alone mat, or as an interlocking continuous length, this mat is perfect for assembly lines, welding areas, picking lines, and other heavy duty dry work areas. Production time: 3 to 5 business days. Size Disclaimer: Please be advised that mat sizes are not exact measurement. Please allow a 3% - 5% variance in all finished mat sizes (tend to shrink) due to materials and manufacturing processes. Specify Ends, Centers or Singles when ordering from the drop down above. 1. 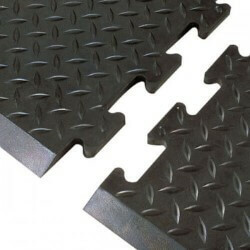 Solid rubber construction formed with a diamond deck plate pattern on top surface. 2. A sturdy waffle support system on the underside achieves maximum safety and comfort for the worker. 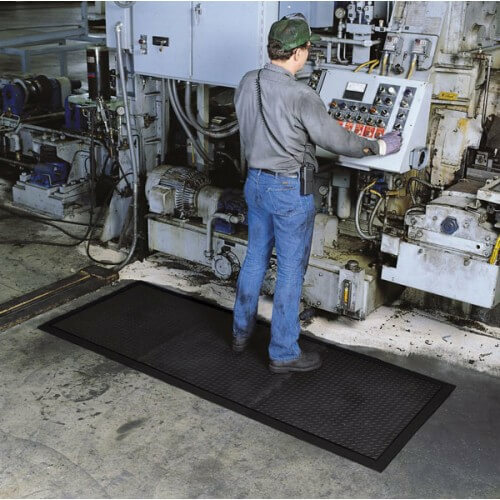 As a single work station mat with beveled borders on all 4 sides. As a mat with interlocking teeth on one end to serve as an "End" mat. As a mat with interlocking teeth on both ends to serve as a "Center" mat. 4. Specify Ends, Centers or Singles when ordering. WARNING This product can expose you to chemicals including phthalate, which is known to the State of California to cause cancer and birth defects or other reproductive harm. For more information go to www.P65Warnings.ca.gov .